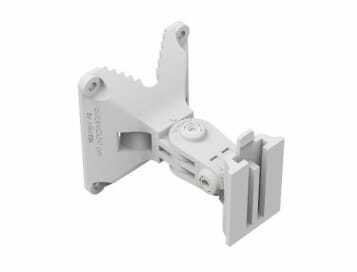 The MikroTik quickMOUNT pro is a advanced wall mount adapter for small point to point and sector antennas. You can mount it on the wall or use it as an adapter from large diameter pole to small size antenna mounting clip ensuring reliable fitment. The quickMOUNT pro gives the possibility to turn antenna within 140 degrees both in horizontal and vertical plane. With the quickMOUNT pro it is possible to perfectly set antenna alignment using integrated graduated scale. You can use the quickMOUNT pro with any pole mountable device or Mikrotiks small mounting clip with weight less than 1.5 kg. Just a mount, uch the same as the others available with a ball joint.